The use of N_Port ID Virtualization (NPIV) to provide host-only ports (NPIV target ports) and spare nodes improves the host failover characteristics by separating out host communications from communication tasks on the same port and providing standby hardware, which can be automatically introduced into the cluster to reintroduce redundancy. Because the host ports are not used for internode communications, they can freely move between nodes, and this includes spare nodes that are added to the cluster automatically. 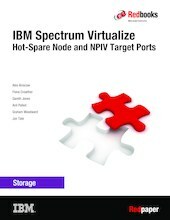 This IBM® Redpaper™ publication describes the use of the IBM Spectrum™ Virtualize Hot-Spare Node function to provide a high availability storage infrastructure. This paper focuses on the functional behavior of hot-spare node when subjected to various failure conditions.